The mothers came from the forest and found a vast dry land. The sun, unmoving, shone down and burned their skin. Displeased, a few sisters traveled north and crossed the mountains to escape his light. Those who stayed, took of the land and were marked forever. They filled the vast emptiness before them with a village of metal where their children need not labor. The gods who followed the mothers fled from this land, afraid. 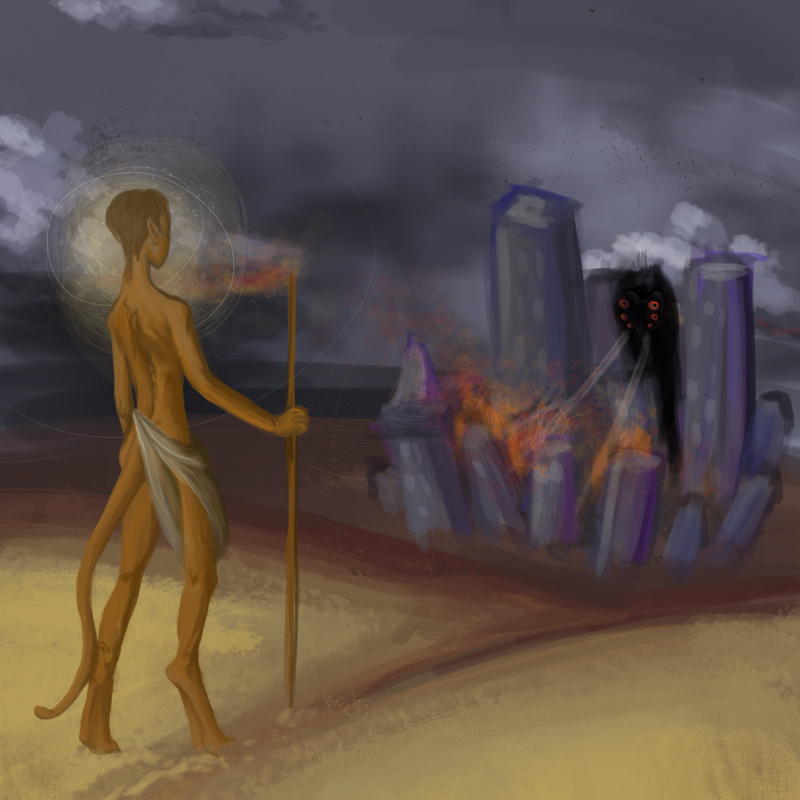 The barren land was filled with large buildings, but without the gods they were still lonely. The children created a new god out of the materials left by their mothers. She was praised by all. Micha, a boy who lived on the outside, saw the god and knew the future. He was verkhnemchelov, outcast from the metal village, but he returned to the village despite of his fate. The god became displeased with the children and punished them. The children Micha met saw his second spirit and pronounced him the Vidvoya. She built a tower which touched the heavens, raining them down onto the false god. As the metal god fell, the village burned. The children followed Micha to the desert, never to return to the village again. Micha lead the children deep into the desert. She saw her children were dying. The desert had taken all but 6. She taught her remaining children of the land, the animals, the plants, and the sky. When she was finished, they were grown and were mothers. From the desert she picked the fruits of the land, and handed one to each mother. The Vidvoya explained that the mothers would be known collectively as The Vibranni. After eating each fruit, the mothers would bear the color their souls. The mothers took of the fruit and their skin developed into 6 different radiant colors Red, Purple, Blue, Green, Yellow, and Orange. The mothers wandered to all corners of the land, taking the fruit bestowed upon them.